1. Most powerful Single pulse energy 1500mj, easy and complete to remove the endogenous pigment in deep skin. 2. Computer system can control output power exactly which is more stability, without any risk. 3. It has good effect on more application including pigments on skin and dermis,lift the skin style and so on. 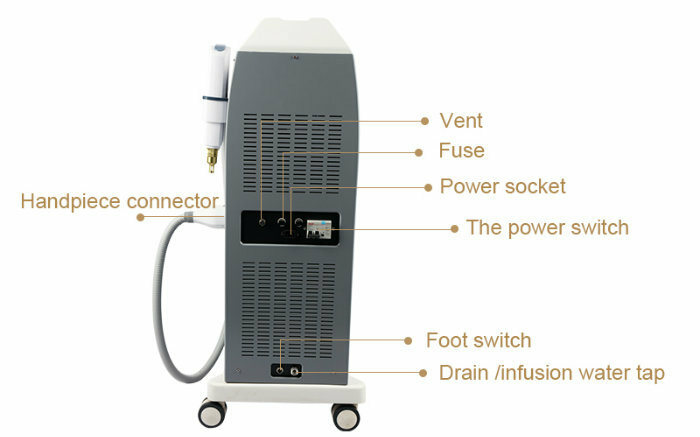 The special wavelength of Q-Switched ND:YAG laser can penetrate skin of human body according to the theory of "selective laser decomposing" Q-Switched ND:YAG laser removes pigment by the effect of explosive high energy from laser. Because the pigment particle in objective organization absorbs high energy, so the superficial epidermis will be bounded out of the body at the moment, while the other part of the pigment will spilt into the tiny granules that can be engulfed by macrophages of the body .After the digestion of macrophages, it can be excluded from the lymphatic system of the body. The pigment becomes shallow gradually until disappears totally. 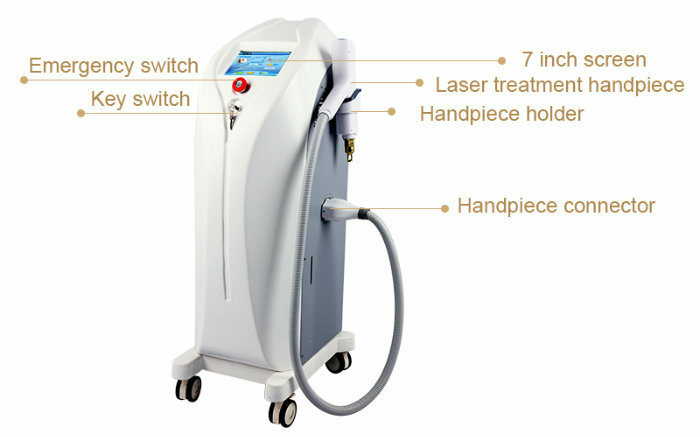 The Q-switched ND:YAG laser absorbed the black, blue with 1064nm frequency and the red, pink, purple, brown with 532 nm frequency of the tattoo or pigmentations removed without damages to normal tissue. 1. Most powerful Single pulse energy 2000mj, easy and complete to remove the endogenous pigment in deep skin. lift the skin style and so on. 4. Humandesign interface, 8.4`color touch screen. Don't need to change the heads. 8. Enough internal space for update system in future. 1064nm Circular, emit white laser light, mainly cure the black, dark colored tattoo and pigments. Function:Â Â eyeliner, eyebrow removal, pigmentation, freckle, age pigment, coffee spot removal,Â Â stria gravidarum removal, birthmark removal,Â Â nevus of ota removal and skin whitening. Logo customize Supported loading interface. Aluminum Alloy Case with Plastic Foam Inside.Strong package make sure safe transportation. Delivery time: 6Â Work Days. DHL, UPS,Fedex,EMS,TNT door to door shipment. 1. Door to door services by air: DHL, UPS, TNT, FEDEXâ€¦you can get the machine within 6Â Â Â days! 4. Professional guide:Â Â 24 Hours Professional online customer service,Engineer after sale team for professional Guide5. OEM&ODM service for distributor. high-end products for plastic surgeons, dermatologist, physicians, and healthcare professionals. 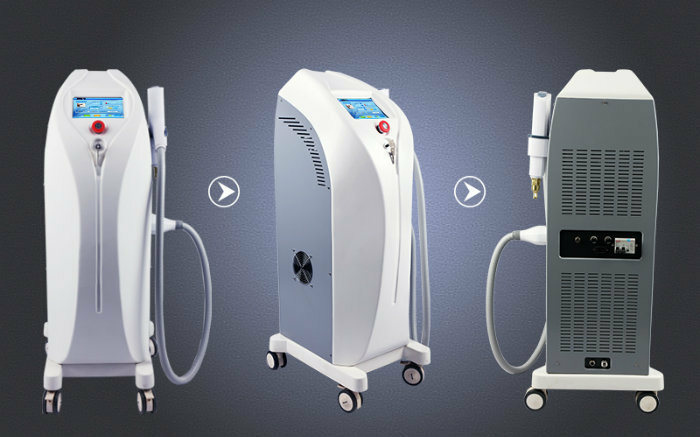 With various reliable product line including IPL, RF microneedle, CO2, Diode laser, and Q-Switch laser, KEYLASER serves the industry as one of the leading companies with rigorous R&D level and valuable experience. KEYLASER developes the most progressive product to lead global market and products are being globally marketed by overseas offices.KEYLASER is cooperating with world-wide distribution partners to provide the highest customer satisfaction. For more information,please feel free to contact us! You have your dream ,Â and we have our Faith . Believe here and Start here ,Â KEYLASER ! UPS, TNT, FEDEX... by air; and the sea transportations. 2: About the delivery time? Within 7Â working days after payemnt received. Strong and beautiful aluminum alloy case. documents for you, also you can contact us by telephone, webcam, online chat (MSN, skype...). 5: About the payment method? Our payment terms is T/T, Western Union. 6: About the after-sale service? We provide 24 months long warranty to customers. Any questions, please don't hesitate to contact me!! Intravenous simply means "within vein" (or "inside the vein"). Therapies administered intravenously are often included in the designation of specialty drugs. Intravenous infusions are commonly referred to as drips because many systems of administration employ a drip chamber, which prevents air from entering the blood stream (air embolism), and allows an estimation of flow rate. Intravenous therapy may be used to correct electrolyte imbalances, to deliver medications, for blood transfusion or as fluid replacement to correct, for example, dehydration. Intravenous therapy can also be used for chemotherapy. Compared with other routes of administration, the intravenous route is the fastest way to deliver fluids and medications throughout the body. The bioavailability of the medication is 100% in IV therapy. Intravenous infusions are fluid solutions administered through a vein. There are numerous different types of solutions available, but they can be broken down into simple categories depending on the function they serve. Some replace lost fluids, and others provide nutrients, replace lost blood, and deliver medications. One of the most common uses for intravenous infusions is to replenish fluids lost through dehydration. These infusions often contain normal saline solution, a combination of sterile water and sodium chloride. This solution is known as an isotonic crystalloid, or a solution that contains the same amount of electrolytes as plasma in the body. It is used in cases of moderate to severe dehydration, such as that caused by vomiting or diarrhea, when replacing the fluids quickly is vital. When a patient`s gastrointestinal tract is compromised and nutrients cannot be absorbed - or eating can worsen the condition - intravenous infusions called total parenteral nutrition may be given. These solutions contain a mix of sterile water, electrolytes, sugar, proteins, fats, and other nutrients, depending on the needs of the patient. Diseases and disorders that commonly require total parenteral nutrition include late stages of Crohn`s disease, obstructive bowel disorder, and ulcerative colitis. Intravenous infusions are also used to deliver medication directly to the blood stream. Certain medications, such as intravenous immunoglobulin, a type of antibody, can only be given through the vein. Other medications, such as certain narcotic pain relievers, are given intravenously because the method allows them to they work faster than when taken orally. Chemotherapy for treatment of cancer is also typically given intravenously. When performed by a medical professional, intravenous infusions are typically safe. The most common reaction is mild pain and redness at the site of the injection, although different medications may cause different side effects. Any time the skin is punctured, there is a risk of infection. Having a medical professional, typically a nurse, monitor the Intravenous Infusion and change the injection site when irritation is evident can help prevent complications.